Although these look a bit amateurish by today’s standards they were the only option for sales meetings and conferences. Not just the domain of the Lecturer, the OHP allowed for interaction and spontaneity in business meetings as you only needed a permanent pen to add notes, draw, highlight, interact and get feedback in a meeting live on the screen. And there is nothing like interaction and audience participation to keep people awake! 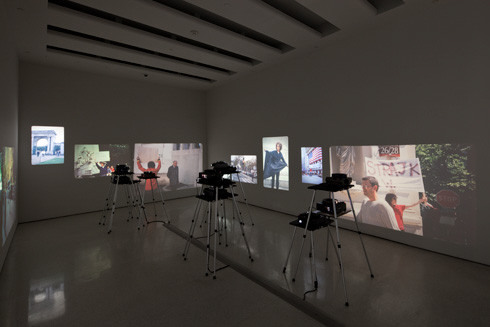 With the invention of the Slide Projector from companies such as Kodak presentations became more professional and more portable. A slide carousel could take around 80 slides…. more than enough to bore any audience to tears! For conferences we would produce hundreds of slides and connect up banks of slide projectors to make animated sequences (called Audio-visual slideshows) and create simple effects we take for granted today such as slide text build-ups. Sound tracks and effects would be stored on large reels of audio tape! 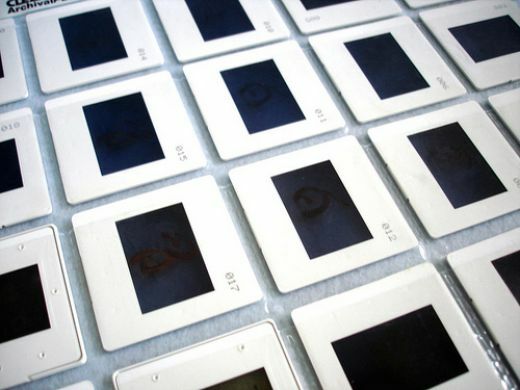 The 35mm slides were created on the first Computer Graphic Workstations like Genigraphics by GE. The agency I worked for in the late eighties invested in these workstations from the US built by a company called Pansophic. Each Workstation cost the best part of £50,000 back then which was a very significant investment. Slides would be created on the workstation using Graphics Tablets and then physically photographed using a Nikon 35mmm camera. The slides would then be developed in a lab and mounted ready for projecting (whilst trying to avoid getting any dust etc in each one!). For slides that included photos you created these using a process involving black and white masked areas and a Rostrum Camera. To create a 30 slide presentation could take all day! Although a bit off topic, it is well worth taking a look at this episode of Mad Men where Don Draper pitches the ad campaign to senior Kodak Execs for the slide carousel – a real Mad Men classic! Around the early 1990′s companies started trying to create these AV slideshows fully on computer to speed up the process and to get more visual effects (slide transitions etc). Products like Inscriber started to emerge which was a beautiful presentation product – although very expensive. Then there was Corel Draw and Harvard Graphics. On May 22nd 1990, Microsoft unleashed PowerPoint to the world. Desktop PC’s had just started to be commonplace in the business world and PowerPoint took over as the best option for creating slideshows for events and meetings. We had to haul around desktop machines in padded carry cases until laptops became affordable and then the presentation was really taking off for business meetings. 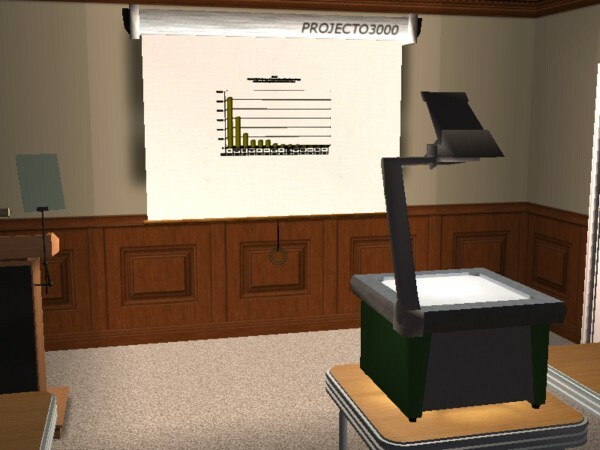 PowerPoint to this day continues to be the tool of choice for business presentations. However despite being the industry standard it also has a reputation for a negative effect in meetings with the phrase ‘Death by PowerPoint’ often heard. This is mainly down to the competence of the user rather than the product itself however! Since the early 2000′s corporate organisations have been looking for alternatives to PowerPoint. The only real alternative at that time was to commission an expensive animated presentation with a specialist design agency (Multimedia agency or New Media agency as they were often referred to). These Multimedia presentations were delivered on CD Roms. The presenter or viewer could navigate through the presentation in different directions using menus so you didn’t have to sit through lots of boring slides in a linear order – you could cut to the chase! They were expensive to commission though and you had to go back to the agency to slides changed/updated. There was a real appetite with corporate organisations to find a different alternative presentation software product to PowerPoint and so many different niche products started to spring up. These have included Presentia, Fabric, Prezi, Sliderocket, Keynote (on the Mac), iPresent, Brainshark, and Haiku. Our agency Plus Two have led the way in the UK with our Presentia product having created our first version in 2001. We quickly spotted the opportunity and for some time had a real USP with Presentia. The product got us through the door of huge organisations such as Canon, Morgan Stanley, TNT, Sanyo etc. The premise of the Presentia product has always been based on those multimedia interactive presentations in terms of impact, interactivity and engagement. BUT with the ability for the end user to be able to create their own content and make changes. What makes Presentia different to other products is the ability to lockdown branding , messages, fonts, colours, logos etc to ensure consistent branding for corporate companies. Presentations are now increasingly shared online using popular sites like SlideShare. Afterall if you have something good to say you want to get the message out to as many people as possible and websites like these have made social sharing of presentations really easy. The advent of iPads and other Tablet devices has made the business presentation even more portable. A presentation can be opened and given very quickly on an iPad and the nature of the device means it can be very informal around a coffee with a client. Getting PowerPoint on to iPads is a real challenge – the functionality and look of the presentations can’t always be maintained which is a problem for brand sensitive companies. Many companies resort to putting static PDF documents on to iPads. Presentia gives users the same interactive visual experience on their iPad that they have in their laptops. You can also connect multiple iPads loaded with your presentation using WiFi. This means you can be in control as the presenter and your audience can just view your presentation on the tablet you hand out to them. This new approach has been developed firstly for the Banking Sector who do a lot of printed documents (‘Pitchbooks’) that they hand out in presentations meetings. Now they just need to hand out a few iPads and take them through the presentation – much more environmentally friendly than reams of paper! Since 2010 there has been a real appetite to monitor, measure and analyse software products in the corporate environment to ensure Return on Investment (ROI). 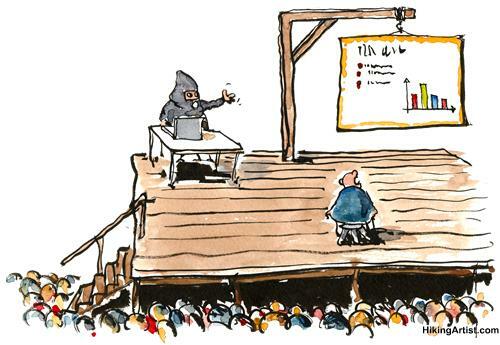 Historically it has been very difficult to measure the effectiveness of presentations. How do you know what your sales people are presenting? Is it on the latest template? Is it up to date? Do potential customers find it enthralling or boring? In a recent release of Presentia we built in analytics so you can see who is actually using the product! You can see when they present, what they present and how long each slide is on the screen. This helps inform sales and marketing personnel on what presentations slides are the most effective in helping to win more new business. So what new trends do I foresee for the next 5 years for business presentations? More interaction with prospective clients in a meeting capturing their views and sharing this via CRM products such as Salesforce. More relevant presentations being delivered where the content is recommended to the presenter based on the information we know about the prospects. Slide content connected with social media interactions for realtime views on a topic or product and personalised to the company or sector being presented to. Presentations will be more snappy with people not giving prospective suppliers lots of valuable time to deliver a half hour slideshow – there will be a need for more succinct elevator-pitch presentations. More touch enabled content which can be manipulated live to respond to feedback from prospects. More smartphone delivered presentations shared wirelessly to any screen either in person or remotely. More adoption of mini Pico-style projectors inside Smartphones. More collaboration between multiple users – bring senior Execs into a pitch presentation screen from other locations around the globe. ….and there will be an overwhelming change in the way presentations are designed at last. Finally there will be less words and more relevant content to support what the sales person says rather than reflect word for word what they are saying! Content is king and this will apply to presentations in the future – snappy and effective!